I had my best friend wedding 2 weeks before my own wedding, and the tradition is we give well sort of bride maids dress' fabrics which we can create by our own how the dress will be like. So my best friend gave me dark dusty pink 'brokat' fabrics and it was pretty. Since I just transform my look into wearing hijab, so i'm a little bit confuse of what kind of dress should I wear on my best friend's wedding.. hmmm.. So I made a sketch and design my own dress, give it to the tailor and walaahhhh! this is it! 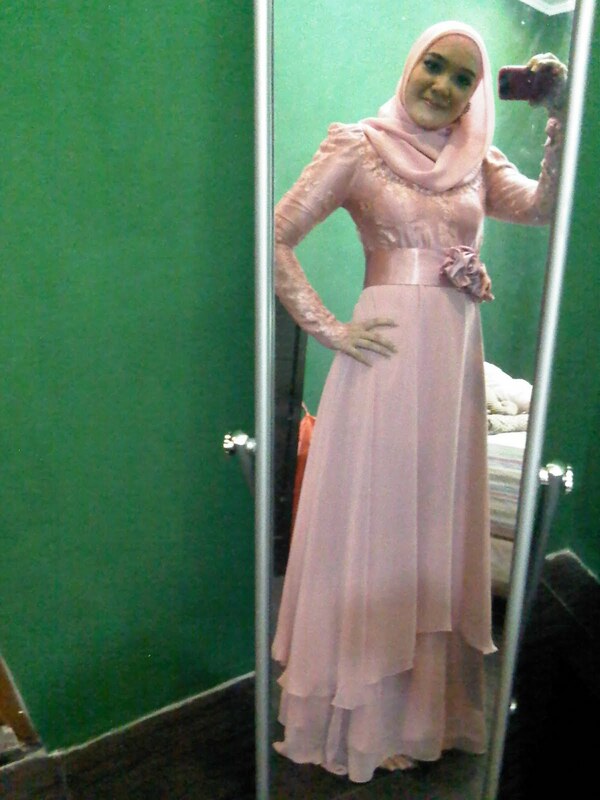 I love the dress and it suits my expectation.. :) here's the picture of me wearing the dress, excuse the quality of the picture alright..coz it was taken using Blackberry camera..
After the dress 'thinghy' was accomplished, now its time to think about the make up.. hmmm.. how the make up should be like? Since I have no time to go to the salon to make myself up (@#*$#?? 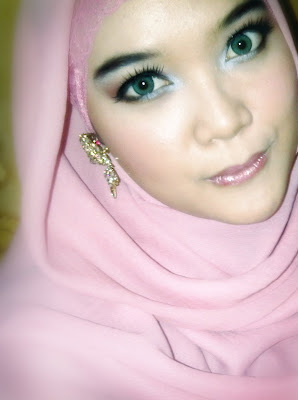 ), so I decided to do the make up and hijab do by myself. I love experimenting with make up and hijab, sooo.. after a while sort of kind of time, here comes the result of my own make up and hijab do.. tadaaaaaaa!!! and for the lips was lipstick from MAC combine with Etude's lipgloss for the final touch! Okay, that's it from me and InsyaAllah I will give you more details about the make up that use, the brand, the look, the number, etc.. I just need more time to do that since now I have a husband to take care of :p thanks guys! or girls.. see ya! buat rangkapan brokat pake bahan apa? wow..u look stunning..btw, u really designed it on ur own??? Woooowww!! Dress-nya bagus mba,,bisa tau bahan shifon yg dipakai butuh berapa meter? hee,,lg butuh inspirasi u/bikin gaun buat pelantikan dokter saya..
Have you made it for sale..?? Cantik banget bajunya, coba bisa diorder ! buatin tutorial make up nya mba. Gaunnya cantiik.. buat wisuda bagus ga yaah?